Ranking on Google is one of the most common goals I hear for a website. It’s pretty much the way people will find your business online, and if you’re not on the first page for the products & services you provide, you may not be picking up any good leads. A local business, like many of those we work with, have the added complexity of people looking for them in a given geographic area. Before you can get your website ranked for this keyword or that, you have to determine what those keywords are in the first place. There are many schools of thought here, but I like to keep things simple. Whether or not you are working with a top-notch SEO company, you know your business best, so start there. Think about wording variations – We used the word “design”, but many people would search “development” instead. So we add that and some others to our list. So just like that, we created a list of 8 solid keywords. Somewhere around 8-12 is a good place to start since it’s a decent variety, but still pretty manageable. After you have your own generated list, we would highly recommend taking a look at what the Google Search Console has to say. If you haven’t yet set that up, check out this post I wrote on it. I’m not going to show you what my Search Console says (and i recommend not sharing that with too many people, especially competition 🙂. 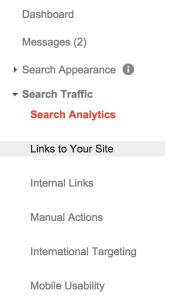 What you’re looking for when you are in your main search console dashboard, is the section called “Search Traffic”. Under there you will see a link to “Search Analytics”. 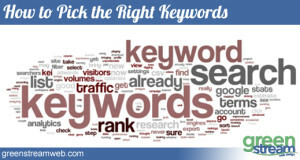 On that page you will see a bunch of great keywords and related information about them. 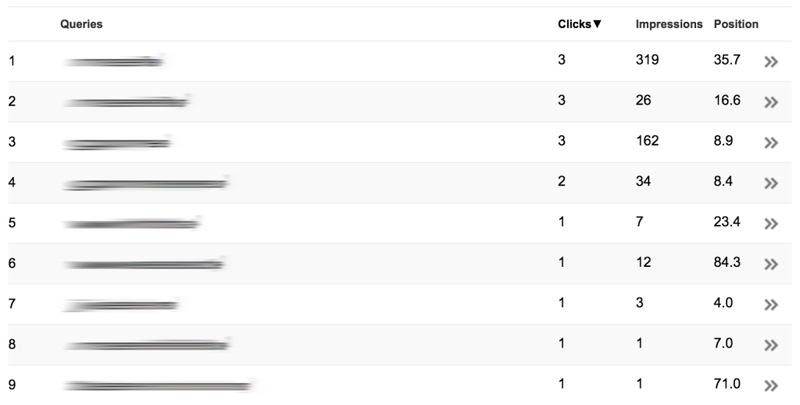 You’ll see what keywords rank in google, how many impressions or views in a search result that keyword showed up and how many clicks it’s had. There’s more info, but that’s the important part for us today. It is important to note that these stats are for general use only, they are not the most correct for ranking stats. What I generally find at this point is a lot of confirmation of what keywords are important and possibly some different keywords or variations I hadn’t been thinking of. 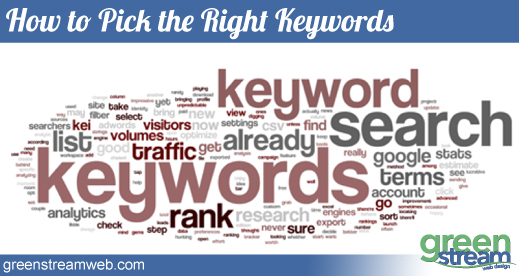 Once you have gone through this list, you may now be adding a few keywords to your original list. So in just a little time and one friendly google tool, you have created a pretty solid starting point of keywords you can now start tracking.